Antwon Rose Shooting: Trial Begins For Police Officer Former East Pittsburgh police officer Michael Rosfeld fatally shot Antwon Rose last summer, sparking local protests. Former East Pittsburgh police officer Michael Rosfeld at the Dauphin County Courthouse in Harrisburg, Pa., earlier this month. A white suburban police officer goes on trial in Pittsburgh on Tuesday for fatally shooting an unarmed black teenager last summer. 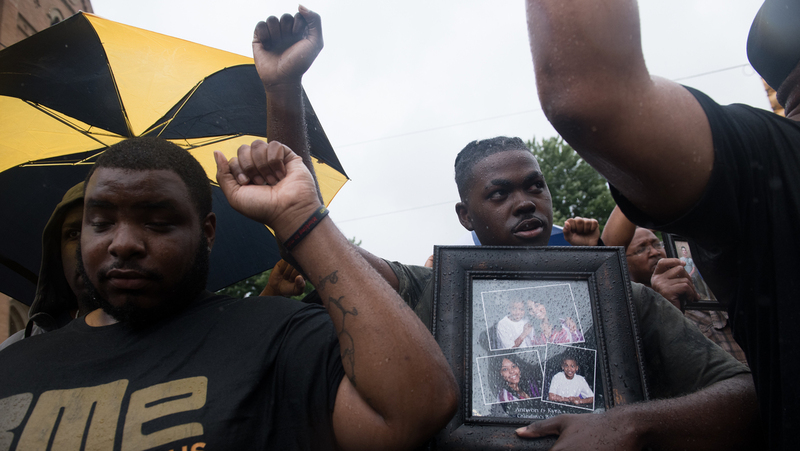 Former East Pittsburgh police officer Michael Rosfeld shot and killed 17-year-old Antwon Rose in June 2018 as the teen ran from a car that the officer had pulled over. The vehicle had been involved in a drive-by shooting 13 minutes earlier. The teen, however, was unarmed, and just last week, another passenger in the car pleaded guilty to firing in the drive-by. Someone in a nearby house filmed the officer shooting at Rose and posted the video on Facebook hours later. "Before the police could create a narrative that would justify the shooting of Antwon, we saw the video: We saw him running away," local activist Jasiri X said. Rose's death sparked weeks of protests that shut down local roadways. Demonstrators felt that Rose's death fit a national pattern of police brutality against black residents. Allegheny County District Attorney Stephen Zappala charged Rosfeld with homicide the week after the shooting. "You do not shoot somebody in the back if they are not a threat to you," Zappala said. The district attorney added that the officer gave conflicting accounts of whether he thought Rose was armed. Rosfeld's attorney, Patrick Thomassey, contends that the fact that Rose was in a car involved in a drive-by shooting should be taken into account. "This car was involved in an attempted murder — that's why it's being stopped. It's not being stopped for going through a stop sign," the lawyer said after a hearing in September. Pittsburgh civil rights attorney Tim O'Brien said the jury will need to decide whether the officer could have reasonably seen Rose as a threat. O'Brien noted that the law gives police the benefit of the doubt and said Rosfeld's lawyer will argue a number of factors: "that the officer's ability to observe wasn't as clear because it was dark, because of where he was standing, that he misinterpreted something that he saw." A man holds a photo of Antwon Rose during a June 2018 protest in Pittsburgh. Former East Pittsburgh police officer Michael Rosfeld shot and killed 17-year-old Rose as the teen ran from a car the officer had pulled over, sparking protests across the city. 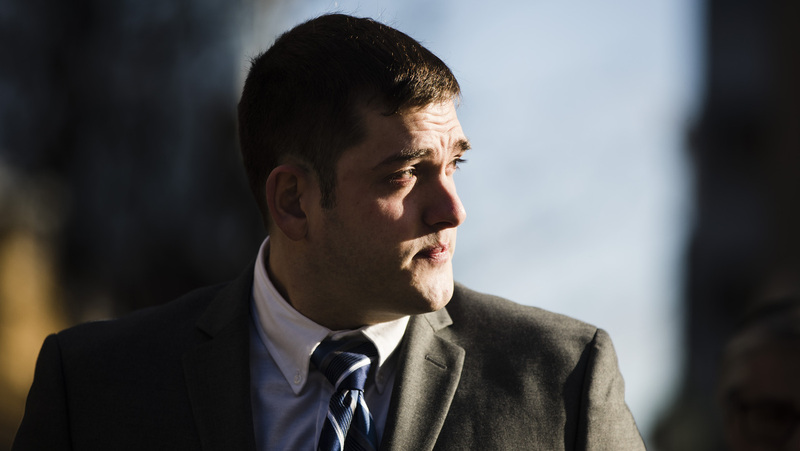 Moreover, Rosfeld's case revealed that the suburb of East Pittsburgh had no policy on when to use deadly force. University of Pittsburgh law professor David Harris predicted that this fact will be part of Rosfeld's defense. "'I was trained this way. I did what I was trained to do. I did not go outside the training,'" Harris said. "That's what his contention will be." Activist Jasiri X said no matter what the defense argues, he hopes the video of the shooting will convince jurors. "Video of a young man running away unarmed, being shot three times in the back — it should be open and close," Jasiri X said, "and the fact that it's not is super-problematic." The shooting generated so much publicity that a judge worried that a local jury would deny Rosfeld a fair hearing. Jurors will come from Harrisburg instead. Since they must travel about 200 miles to Pittsburgh, the trial will run through the week and into the weekend if necessary.